4:30pm Clinical case: Pamela King (Marseilles), practicing analyst, NLS. 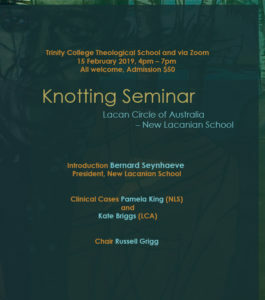 5:30pm Clinical case: Kate Briggs (Melbourne), practicing analyst, LCA. Chair: Russell Grigg, President LCA. the seminar, at 10pm. After this time, please write to convenor@lacancircle.net directly. There will be no walk-up registration on the day. Visa, Mastercard, or Amex welcome. All our credit card processing is via eWay.